an exhibition which explores the global Conceptual art movement over two decades of photography, through the work of 26 artists from 13 countries. The presentation investigates different conceptual uses of photography within practices dealing with Feminism, political activism, performance and social critique. Eleanor ANTIN, Keith ARNATT, Renate BERTLMANN, Marcel BROODTHAERS, Günter BRUS, James COLEMAN, Ger VAN ELK, Hans-Peter FELDMANN, Robert FILLIOU, Barry FLANAGAN, Hans HAACKE, Nigel HENDERSON, Ed HERRING, John HILLIARD, Kurt KREN, John LATHAM, Roelof LOUW, Ana MENDIETA, Tony MORGAN, Otto MUEHL, Dennis OPPENHEIM, Gina PANE, Liliana PORTER, Dieter ROTH, Rudolf SCHWARZKOGLER, Marie YATES. Highlights of the exhibition include Eleanor ANTIN’s 100 BOOTS (1971): Antin travelled the US photographing 100 black rubber boots in different scenarios, as a comment on the displaced people in America. To advertise her photos, she distributed them as postcards in a revolutionary global mail-art project. Ger van ELK’s The Co-founder of the Word O.K. (1971): Comprising three photographs taken on Hollywood Boulevard of the artist miming the word ‘O.K’, this work which makes light of tourist attractions, was described by Van Elk as “touristic expressionism”. 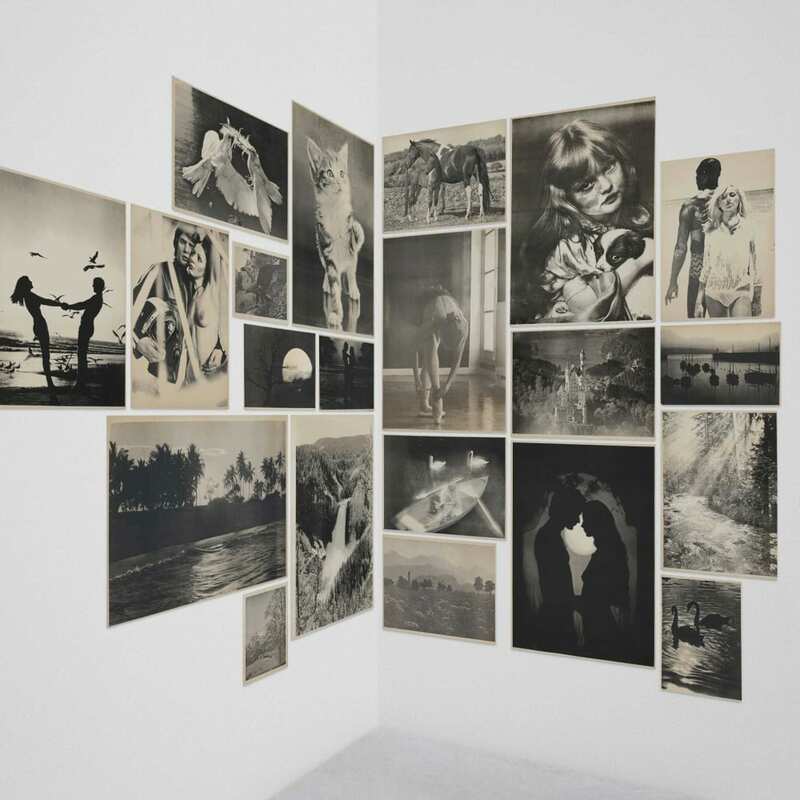 Hans-Peter FELDMANN's Sunday pictures (1976): A dedicated collector of images, Feldmann is famous for grouping found photographs and writing them a new narrative. This work gives a romantic collective meaning to what originally were throw-away images. Hans HAACKE’s Upstairs at Mobil (1981): Comprising a photo-etching of images and text across 10 panels, this work voices the artists politically driven satirical exposé of the marketing strategies of oil company Mobil. Nigel HENDERSON’s Photograms (all c.1958): Also known as ‘Hendograms’, these rarely exhibited early examples of experimental British photography were made using an enlarger given to Henderson by Eduardo Paolozzi, and the debris he found walking the streets of London’s east end. John HILLIARD’s She Observed Her Reflection In The Glass (1976): A triptych of photographs taken inside London’s National Portrait Gallery of Velázquez’s The Rokeby Venus (1647-51) and a woman in the foreground observing the work; playing with ideas around the art object, reflection and gaze. Kurt KREN’s Video Stills (1960s-1970s): A collection of highly experimental films of actions and performances by the Austrian pioneer of structural film-making, spanning two-decades. Roelof LOUW’s Mirror Fragmentation (1977): A large-format photographwhich depicts a broken mirror carefully placed on the floor of an empty room, integrating and expanding the interior architectural space. Dennis OPPENHEIM’sReading Position for Second Degree Burn (1970): Where we see the artist sunbathing for 5 hours, a book placed over his chest, recording the change in his skin tone before and after. Rudolf SCHWARZKOGLER's Aktion mit seinem egenen Korper [Action with one’s own body] (1966): The Viennese Actionist was 25 when he staged this performance, just 4 years before his death. In a sequence of 15 photos he embodies a despairing feeling toward the cruelty of the world. The work belongs to his Aktion series, which also takes the title of the show. Marie YATES’ Waterfall Working Islawr-dref (1975): The visual and textual documentation of a journey in the wild, this marks the first time this work has been on public view since 1975, when it was produced for the British Council exhibition "Time Words and the Camera". AKTION: CONCEPTUAL ART & PHOTOGRAPHY (1960 – 1980) precedes a presentation of the photographic and video work Voyage to Italy (2008) by the British artist Victor BURGIN, opening 30 August 2018.